On Friday afternoon, 30 March 2018, Israeli forces killed 9 Palestinian civilians and wounded 709 others, including 121 children and 26 women in the Gaza Strip, in excessive use of forces and upon a political decision at the highest political level in Israel to suppress hundred thousands of civilians participating in fully peaceful protests within hundreds meters away from the border fence with Israel. Israeli forces directly targeted these protesters without any justification and without the latter posing threat or danger to life of the Israeli soldiers. According to field observations by fieldworkers of the Palestinian Center for Human Rights (PCHR), dozens of Israeli snipers stationed behind sand barriers along the border fence, east of the Gaza Strip, sporadically and deliberately opened fire at the participants in the peaceful assemblies that included hundred thousands of civilians and concentrated in 5 areas in the eastern Gaza Strip. As a result, civilians were directly killed and wounded. 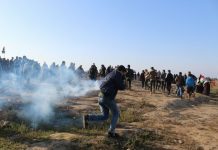 The observations of PCHR’s fieldworkers revealed that the Israeli forces focused on targeting the participants in the back rows of the demonstration as they were falling one by one around 300 meters away from the border fence in addition to others who attempted in a few numbers to approach the fence. This proves that there is an official decision to kill and cause bodily harm to the demonstrators, in conformity with the policy of intimidation adopted by the Israeli forces, spokespersons, and officials during the past few days to reduce the public participation. According to PCHR’s investigations, on Friday early morning, 30 March 2018, ten thousands of civilians, including women and children, within entire families started swarming to 5 camps established by the Supreme National Authority for the Great March of Return and Breaking Siege in eastern Rafah City; Khuza’ah in Khan Younis; al-Bureij in Central Gaza Strip; Shuja’iyah neighborhood in Gaza City; and Eastern Jabalia in the northern Gaza Strip. Israeli forces early started to target the assemblies, which were fully peaceful, inflicting dozens of casualties. Following the Friday Prayer, the number of participants in the five assemblies increased, reaching to hundred thousands of men, elderlies, women and children. They were standing dozens to hundreds meters away from the border fence and raising the Palestinian flags, while only a few numbers of them attempted to approach the border fence in order to throw stones and raise flags. The Israeli forces fired live bullets at the protesters. As a result, -until 17:00 on today according to PCHR’s fieldworkers’ documentation- 8 protesters were killed, including 2 in eastern Jabalia, 4 in eastern Gaza City and 2 in eastern Rafah. All of them were hit in the upper part of the body; head, chest and abdomen. Moreover, 708 civilians were wounded, including 121 children, 26 women and a journalist, in addition to hundreds suffering tear gas inhalation after tear gas canisters were heavily fired by the soldiers stationed along the border fence and by drones hovering over the protesters. It should be noted that the Israeli forces are still targeting the protesters, portending the increase of victims’ number. Mohammed Kamal al-Najjar (25) from the northern Gaza Strip was hit with a bullet to the abdomen, east of Jabalia. ‘Abdel Fattah Bahjat ‘Abdel Nabi (19) from the northern Gaza Strip was hit with a bullet to the head, east of Jabalia. Amin Mahmoud Mansour Mo’amar (25) from Rafah was hit with a bullet to the head, east of Gaza. Ibrahim Salah Abu Sha’er (20) from Rafah was hit with a bullet to the head, east of Rafah. At approximately 04:30 today, Israeli forces fired 2 artillery shells at 2 civilians who were collecting parcel from an agricultural land around 1000 meters away from the border fence with Israel, east of al-Qararah. As a result, one of them, namely ‘Omer Wahid Nasrallah Abu Sammour (27), was killed arrived pieces at the Gaza European Hospital while the other sustained moderate wounds. Both civilians had to wait half an hour in the scene until the medical crews could have access and take them to the hospital. This huge number of victims proves that the Israeli forces continue to commit further crimes and use of excessive force against Palestinian civilians in disregard for their lives upon an official political decision. PCHR emphasizes that before occurrence of demonstrations –previously declared by the organizers as peaceful demonstrations only calling for implementation of United Nation (UN) Resolution 194 and raising only Palestinian and UN flags-, the Israeli forces sent threatening letters to intimidate the organizers and Gaza Strip residents in addition to deploying snipers and dog sniffer unit along the borders with Gaza as declared by Spokesperson of the Israeli Army on his Facebook page. The spokesperson also threatened that “ if needed, we will respond in the center of the Gaza Strip against those behind these violent protests,” Hinting about committing crimes of extra-judicial killings (assassinations). PCHR hereby condemns this new crime committed by the Israeli forces that resulted in this huge number of causalities, killed and wounded, believing it is as a result of the international community’s silence towards the crimes committed by the Israeli forces upon an official decision at the highest military and political levels. PCHR points out that the targeting this time was against explicitly peaceful assemblies that include hundred thousands, including thousands of children and women, and by directly firing live bullets without those demonstrators posing any threat to life of soldiers and in disregard by the Israeli forces for the life of hundred thousands of demonstrators. PCHR warns that as long as Israel continues to deny the rights of Palestinians in the Gaza Strip and impose a tightened closure on them in addition to refusing to implement the UN resolutions relevant to refugees and their rights, these demonstrations are expected to continue and increase; a fact that will require the international community and UN Bodies’ intervention to stop the Israeli escalating violations and crimes and to provide international protection for Palestinians in the occupied territory. PCHR also reiterates its call upon the High Contracting Parties to the 1949 Fourth Geneva Convention to fulfill their obligations under Article 1; i.e., to respect and ensure respect for the Convention in all circumstances and their obligations under Article 146 to prosecute persons alleged to commit grave breaches of the Fourth Geneva Convention. These grave breaches constitute war crimes under Article 147 of the same Convention and Protocol (I) Additional to the Geneva Conventions regarding the guarantee of Palestinian civilians’ right to protection in the occupied territories.